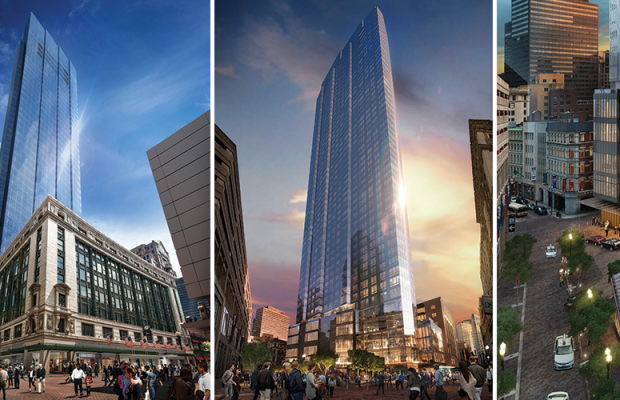 Over 600 feet tall, the Millennium Tower is Midtown Boston’s newest feat of luxury engineering and architecture. The ground floors will be devoted to retail space and will hold a supermarket, boutiques, high end retail stores and fine dining restaurants, including Michael Mina’s exclusive restaurant. On the upper floors, the glass tower will consist of condos that are outfitted with floor-to-ceiling windows, state-of-the-art kitchens, and almost any luxury amenity you can think of. Right outside its doors, find numerous shops, restaurants, and venues located in the Downtown Crossing. Additional Amenities: Owner’s lounge, screening room, parlor, library, children’s playroom, function room, pool, spa, 24-hour concierge. Units will be 759 to 12,846 square feet with grand entryways, floor-to-ceiling windows, Poggenpohl kitchens, marble bathrooms, hardwood floors, designer finishes, state-of-the-art systems, and a washer and dryer.